OPEC members and other oil-producing countries may not be able to agree a reduction in output to help shore up plunging prices, Saudi Arabia said on Thursday. "No, I am not confident," Saudi oil minister Khalid Al-Falih told reporters after coming out of a meeting of the Organization of Petroleum Exporting Countries in Vienna. "We're still debating the distribution" of any possible cuts, he added. Iraqi minister Thamir Abbas Al Ghadhban said deliberations would continue on Friday. But he said: "We are hopeful that an agreement can reached." 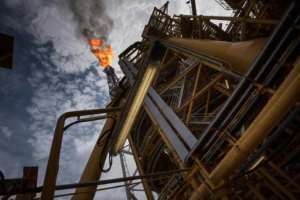 Unusually, the oil cartel had scrapped a planned news conference on Thursday at which the members had largely been expected to announce a new reduction in output to stem the recent sharp drop in the price of crude. 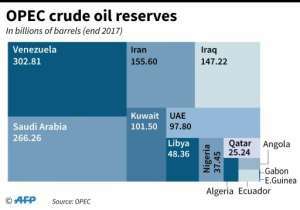 OPEC's 15 members had been meeting in the Austrian capital on Thursday to decide what action to take, a day after US President Donald Trump took to Twitter to urge them not to cut output. The group is scheduled to meet again on Friday, this time with other oil-producing countries that are outside the cartel -- notably Russia -- to coordinate a joint policy. Earlier, Saudi oil minister al-Falih had said that a cut of a million barrels per day would be ideal. "Ideally, everyone should join equally. I think that's the fair and equitable solution," he said. Nevertheless, the volume and distribution of the cuts will depend on the participation of Russia, whose energy minister Alexander Novak is only expected in Vienna on Friday. Novak, speaking from Saint Petersburg on Thursday, said that his country was watching closely how the situation was developing. But with Russia heading into winter, "climate conditions" made it "much more difficult (to cut output) than for other countries," he said. Analysts took that as a hint that Russia might only sign up to additional cuts at a later date. The price of a barrel of Brent, the European benchmark, fell four percent to below $60 Thursday because the projected reduction of around one million barrels was below what markets had been expecting, said CMC analyst, David Madden. "We don't need permission from anyone to cut," Saudi minister Al-Falih said. The US "is not in a position to tell us what to do." Iran, OPEC's third-biggest producer, complained that it was the first time a US president was trying to tell OPEC what to do. "They should know that OPEC is not part of their Secretary of Energy," said its minister Bijan Namdar Zanganeh. Iran wants to be exempted from any cuts that are agreed. Given the economic sanctions being reimposed by the United States, the Islamic republic "(won't) join any agreement for cutting production because of the special situation Iran faces," Zanganeh said. Zanganeh said the estimated surplus currently on the market amounted to 1.3-2.4 million barrels per day. 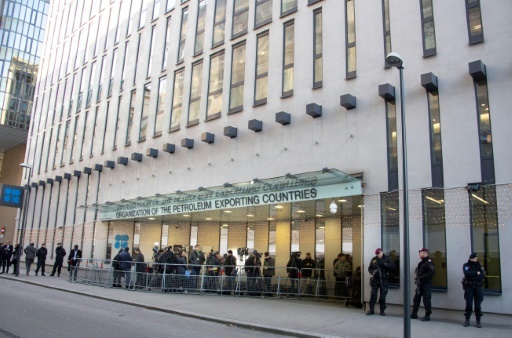 Negotiations between OPEC members are fraught, as some feel that Saudi Arabia wields too much clout in setting policy.